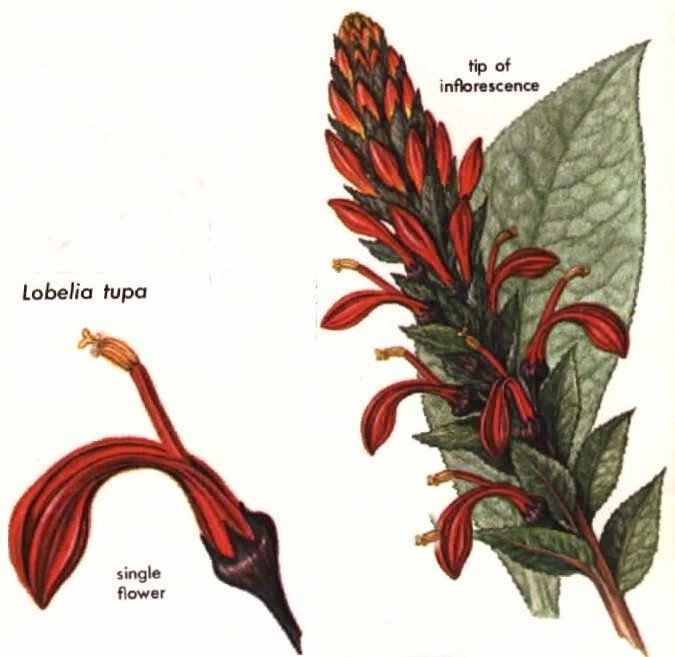 TUPA (Lobelia tupa), a tall, variable plant of the high Andes, is also called tabaco del diablo ("devil's tobacco"). In Chile, the Mapuche Indians smoke the dried leaves of this beautiful red-flowered plant for their narcotic effects. Whether they are truly hallucinogenic has not yet been established. They contain the alkaloid lobeline and several derivatives of it. 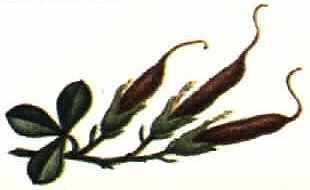 The same alkaloid occurs in some North American species of Lobelia, especially L. inflata, known locally as Indian tobacco. It has been used medicinally and as a smoking deterrent. There are 300 species of Lobelia, mostly tropical and subtropical, and they belong to the bluebell family, Campanuloceae. Some are highly prized as garden ornamentals. 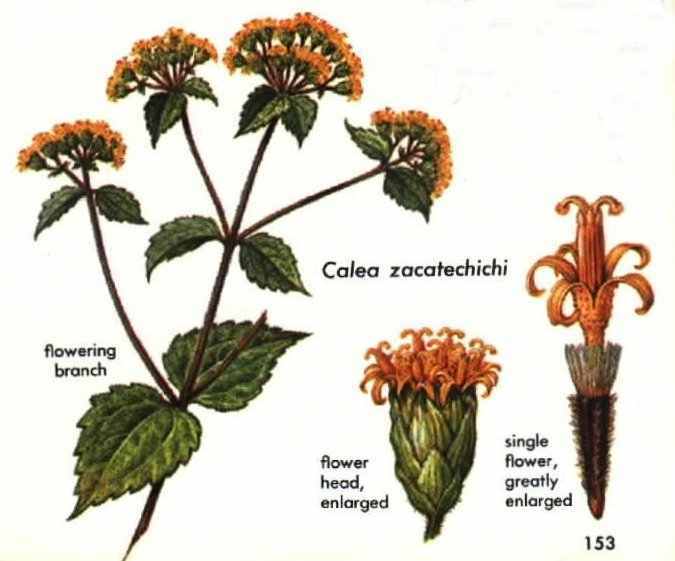 ZACATECHICHI (Calea zacatechichi), an inconspicuous shrub ranging from Mexico to Costa Rica, is a recently discovered hallucinogen that seems to be used only by the Chontals of Oaxaca. They take it to "clarify the senses" and to enable them to communicate verbally with the spirit world. From earliest times, the plant's intensely bitter taste ( zacatechichi is the Aztec word meaning "bitter grass") has made it a favorite folk medicine for fevers, nausea, and other complaints. After drinking a tea made from the shrub's crushed dried leaves, an Indian lies down in a quiet place and smokes a cigarette made of the dried leaves. He knows that he has had enough when he feels drowsy and hears his own pulse and heartbeat. Recent studies indicate the presence of an unidentified alkaloid that may be responsible for the auditory hallucinations. There are a hundred or more species of Calea. They belong to the daisy family, Compositae, and grow on open or scrubby hillsides in tropical America. Some species enter into folk medicine. Psychopharmacology studies the effects of drugs, especially hallucinogens, on the central nervous system. The effects of psychoactive agents result from constituents that belong to many classes of chemicals. All have one characteristic in common: they are biodynamic, affecting normal metabolism of the animal body. Hallucinogens act directly on the central nervous system, but they may also affect other parts of the body. They have both physical and psychic activity. Their effects are usually short-lived, lasting only as long as the chemical remains at the point of action in the body. Pseudohallucinations - often indistinguishable to the layman from true hallucinations - may be caused by many abnormal conditions upsetting body homeostasis, or normal metabolism: fevers, fasting, lack of water for long periods, poisons, etc. Pseudohallucinations may often be of much longer duration than hallucinations. If a plant contains an active substance, its medical potential is of interest to pharmacologists. Investigation may indicate that true hallucinogenic compounds have value for purposes far removed from their psychoactivity. An example is scopolamine, an alkaloid of the nightshade family. Taken in proper doses, it intoxicates, inducing a state between consciousness and sleep and characterized by hallucinations. Scopolamine, however, has medical uses not associated with the central nervous system: it is antispasmodic and antisecretory, mainly in the alimentary canal and urinary tracts. Crayon drawing by a Tukanoan Indian of Amazonian Colombia, depicting one of the images experienced during an aboriginal caapi intoxication. Collected in the field by the Colombian anthropologist Dr. Gerardo Reichel-Dolmotoff, who studied the mythological significance of hallucinogens among the Indians. Some psychiatrists believe that mental disorders are the result of an imbalance in body chemistry: "For every twisted thought, there is a twisted molecule." Some specialists formerly thought and still maintain that "model psychoses" - artificially induced states similar to some abnormal mental conditions - might be a valuable analytic tool. There are many similarities between psychotic conditions, such as schizophrenia, and the mental state induced by hallucinogens. Whether or not the use of hallucinogens to create such model psychoses will be of therapeutic value is still a question, but there is little doubt that hallucinogens may be of experimental help in understanding the functioning of the central nervous system. One specialist states that studies of "various aspects of the normal and the abnormal" may elucidate certain areas of the "hinterland of character." 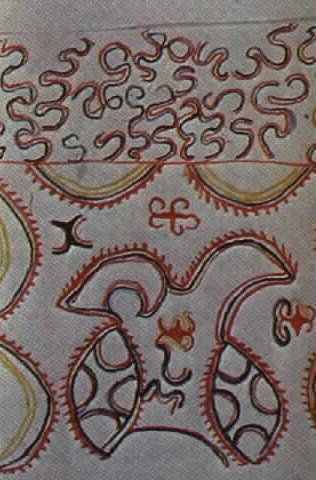 It must be remembered that alteration of the function of the central nervous system by chemicals is not new; it is older than written history. In the past, especially in primitive societies, hallucinogens were employed in magico-religious and curing rituals, rarely for pleasure. In some cultures, notably those suffering acculturation, hallucinogens are sometimes used to enhance social contacts or even for explaining mental disorders. If we compare uses of hallucinogenic plants in primitive societies with the medical value claimed for them by some psychiatrists, we see that model psychoses are not a new development. Artificially induced psychoses have long been used as healing practices in primitive cultures. Although many modern psychiatrists are critical of chemical psychoses as tools in treating mental aberrations, it is too early completely to rule out their possible medical value. In addition to the hallucinogenic plants used by primitive peoples, numerous other species containing biodynamic principles are known to exist. Many are common household varieties like catnip, cinnamon, and ginger. No reliable studies have been made of the hallucinogenic properties of such plants. Some of the effects reported to have been caused by them may be imaginary; other reports may be outright hoaxes. Nevertheless, many of these plants do have a chemistry theoretically capable of producing hallucinations. Experimentation continues with plants - common and uncommon - known or suspected to be hallucinogenic, and new ones are continually being discovered.